In this era of professionalism, sets of footballing brothers are more and more becoming a rarity, however back in the Nineteenth Century with more senior clubs therefore more competitions, there were fewer barriers to brothers playing on with the same clubs. Of course it is not quite so rare for a club to have brothers amongst its ranks, both ESFC and FFC have many examples of this, there is even the case of Michael and Thomas Harley who played for Falkirk until the Summer of 1889 then both at the same time jumped ship to Bainsford. However I know of only one pair of brothers of whom one played for East Stirlingshire and the other for Falkirk. Alex and Michael Drain came from Kilsyth [well they lived in Kilsyth: their father was from Cumbernauld, Alex was born in Rosehall [John & James, brothers in between were born in Airdrie] and Michael was born in Cumbernauld, and a younger brother in Kilsyth]. And it was in Kilsyth football that they were first noticed. 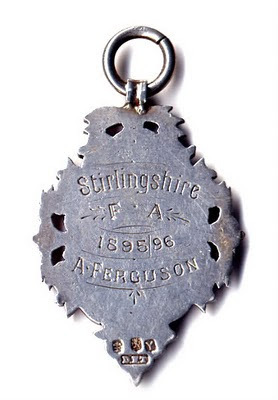 Alex was a solid Left-Back with Smithstone Hibs [and with Kilsyth Hibs when they changed name], before moving up to their bigger rivals Kilsyth Wanderers [getting 'capped' for Stirlingshire], where came to the notice of Glasgow Celtic. Although I do not think he ever made it into the 1st XI, he certainly was a bit of a regular for the reserves for a while. And it was probably the lack of first team chances which prompted him to sign for East Stirlingshire in 1896. However tragedy was to befall him that season, as he was a miner in the real world [he is listed in the 1881 Census, aged 14, as an Iron Miner] and was severely injured in a mining accident, which was to end his life within a year. His wee brother on the other hand played as an inside forward, normally Inside-Right, and first came to notice with the Junior side Kilsyth Emmet in the Stirlingshire Junior Cup and various Junior Leagues in Stirlingshire, by 1898 he had graduated to Kilsyth Wanderers [Kilsyth Hibs having folded in between] before joining Falkirk midway through the 1899/1900 season, but he never quite hit it off at Falkirk, although scoring when he got the chance, you had to be very good to dislodge Andrew Burt & Thomas Baird, and he wasn't quite that good. After Falkirk he dissapeared from my radar, and may have left football altogether. Sadly as there were six years between the brothers, and Alex's early death there is little chance they played together [and no chance that they played on either side of the Falkirk Derby]. But there is still the slight chance they played against each other in some bizarre Kilsyth Charity Competition, but the lack of media coverage for Kilsyth at the times no-one will ever know. I discovered recently these pictures of a Stirlingshire Cup Runners Up Medal from 1895/96, although I have no way of knowing if this is how they looked every season, it gives us an idea of what they were like. 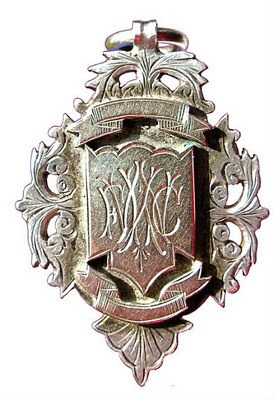 This medal was awarded to Alex Ferguson the goalkeeper of Kilsyth Wanderers.